Why? 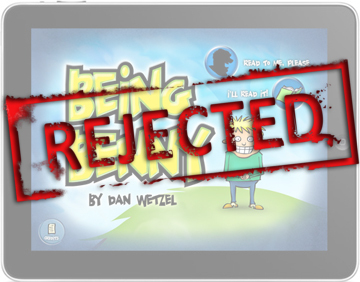 Well, apparently Apple found the "Being Benny" app is "primarily a book" and therefore not appropriate for the App Store. Umm...yeah, that's why it was submitted to the "Books" app category. It seems Apple recently started directing some book apps to the iBookstore which uses the ePub platform, while continuing to allow others into the App Store. The author of "Being Benny," Dan Wetzel, originally came to us because the ePub platform wasn't really suited for a graphics intensive interactive children's book application. So we're scratching our heads a bit. I don't want to say much else right now while awaiting Apple's verdict on appeal, but we're determined to free Benny and make it right.